Imagine how fast the Internet allows us to go about our business. Processing a rate request now happens in seconds, and a request from the other side of the country can be received, processed, and sent back to the lead in seconds. Now imagine processing millions of quotes every day, all across the country. 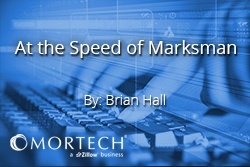 That’s the speed and reach with which Marksman can handle and process a business’s rates. Marksman speeds through more than 12 million rate requests every day, and provides granular, accurate pricing to potential borrowers at the touch of a button. Not only that, but Marksman works to expand your pool of possible customers by pushing your rates out to websites like Zillow®, Bankrate®, and Lending Tree® - allowing for thousands of borrowers to view your rates, who otherwise wouldn’t have been able to. Marksman also provides tools to make running and viewing different loan scenarios as easy as possible. Our Historical Pricing feature allows lenders to view and re-price loans in less than a minute, saving them nearly 200 hours a year. We also provide a scenarios tool that allows lenders to save different scenarios for each prospect, and run those scenarios at a moments notice, to instantly view how each can be priced. Marksman isn’t just about getting your rates to borrowers as fast as possible though, it wants to connect you with them quickly as well. Our Mortech Dialer works to instantly alert you to every new lead, allowing you to minimize wait time to make a faster point of contact with your borrower, and provide less of a risk of losing that lead. Once all of these things are used together, it results in higher rate exposure, as well as faster lead conversion, which means you can handle more clients without having to sacrifice a lot more of your time. It’s one way that Marksman and Mortech can help to improve and increase your business. You can schedule a free, consultative demo today and find out how much better off you could be with Marksman.